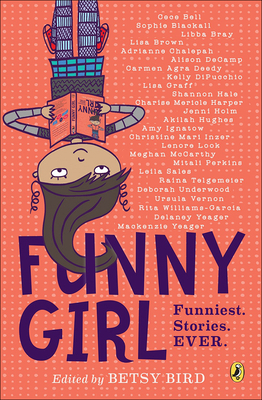 Funny Girl is a collection of uproarious stories, rollicking comics, rib-tickling wit, and more, from 25 of today's funniest female writers for kids. What could be funnier than family? Read stories about Ursula Brown's grandmother driving her on a road trip to disaster, Lisa Brown's little brother getting a Tic-Tac stuck up his nose, and Carmen Agra Deedy's mom setting the bathtub on fire. What could be funnier than friends? Pretty much nothing, as Rita Williams-Garcia shows two besties hatching a bird-brained scheme to get on to a TV talk show, and Deborah Underwood introduces a dynamic dog-and-cat duo teaming up on a pet advice column. What could be funnier than YOU? Tell your future with Mad Libs, discover your Chinese Zodiac sign with Lenore Look, and learn the best tricks of the comedy trade from professional humorists like Adrianne Chalepah and Delaney Yeager. With clever contributions from award-winning and bestselling authors including Cece Bell, Sophie Blackall, Libba Bray, Shannon Hale, Lisa Graff, and Raina Telgemeier, this anthology of funny girls will make you laugh until you cry. Or cry until you laugh. Or maybe you won't cry at all. Either way, you'll definitely laugh. Funny Girl isn't just an anthology: it's a cause, a mission, a movement. Girls are funny. Now it's time for the world to know it. Betsy Bird is the Collection Development Manager of the Evanston Public Library, and the former Youth Materials Specialist of New York Public Library. Betsy reviews for Kirkus, served on the 2007 Newbery Award committee, and her children's literature blog, A Fuse #8 Production, is hosted by School Library Journal. Betsy is the author of the picture book Giant Dance Party (Greenwillow, 2013) illustrated by Brandon Dorman, and a co-author on the nonfiction book Wild Things: Acts of Mischief in Children's Literature (Candlewick, 2014) which she wrote with fellow bloggers Julie Danielson and Peter Sieruta.